I decided at fairly short notice, that I needed to go to London. My #2 son and two friends have just moved into a new flat, I needed to have a meeting with a client about the jewellery website I am designing for him and last but not least, my ex was in town (not in itself a reason to rush up to town but he was bringing some bookcloth from the US for me…) so a trip to London was in order. I decided to travel by train and as some of you might have read (and the rest of you may have heard me complaining from wherever you are reading this!) the train fare to travel from Dorset to London and back the next day was £96. £96!!! Ridiculous. Yes, I now know if I had booked weeks in advance I could have got it much cheaper but I didn’t know I wanted to go weeks ago! I could have flown to the Mediterranean a couple of times for less than that – and it wasn’t even First Class. Anyway, rant over. 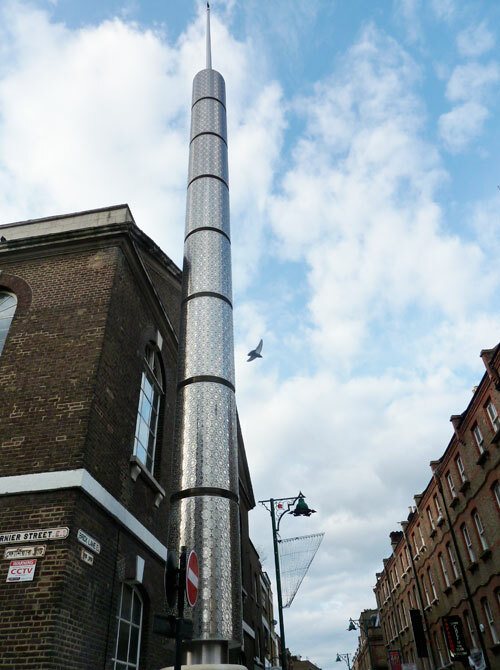 My son’s flat is in Shoreditch, near Spitalfields Market – an area of London which has become very smart, full of great places to eat (we ate at St John Bread and Wine – highly recommended), design studios, art galleries and shops. At the same time it is full of history – it’s ‘Jack the Ripper’ territory – scene of the famous Whitechapel Murders and many of the pubs and places associated with these infamous times are still standing and included in many of the “Jack the Ripper’ tours in the area. 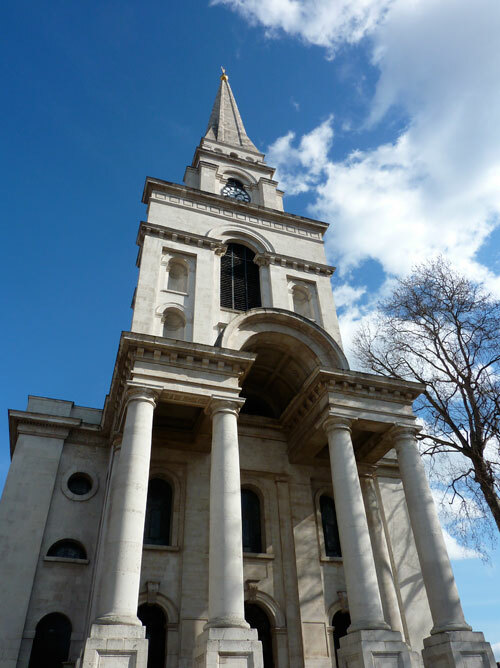 Spitalfields (probably a contraction of ‘hospital fields’) was home to a large community of Huguenots who fled France in 1685 following the treaty of Nantes and who settled in the area bringing their silk weaving skills. They built beautiful houses, many of which are still standing. 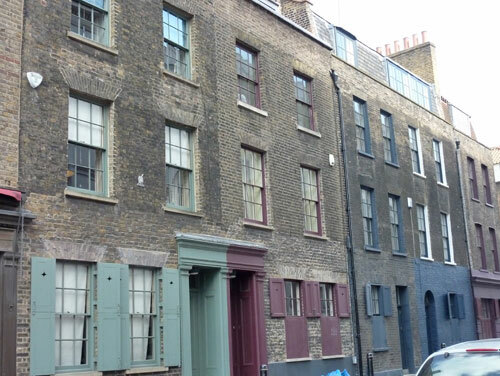 My favourite street was Fournier Street which has been restored beautifully and these homes are now worth a FORTUNE. The area is also home to a large Bangladeshi community centred around Brick Lane, famous for its market and curry houses. I love that the street signs are in English and Bangladeshi. On the corner of Fourner Street and Brick Lane there is a mosque – the Jamme Masjid or Great London Mosque which has in its time been a Huguenot chapel, which then became The Jewish Chapel (for promoting Christianity to the large Jewish population in the area) then it became a Methodist chapel, then it was consecrated as the Machzikei HaDath (or Spitalfields Great Synagogue) and then finally a mosque. What a testament to multiculturalism. 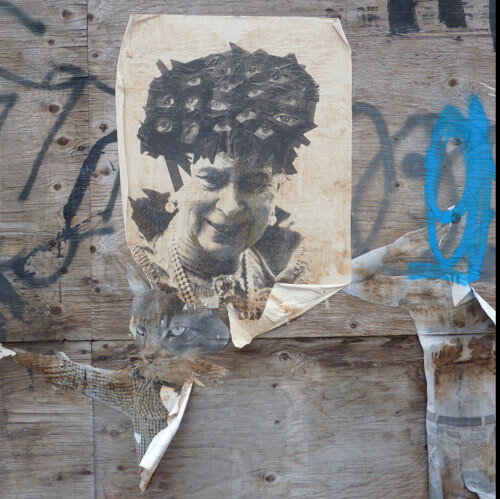 As you wander the streets , you can’t help but notice the amazing graffiti on the walls. 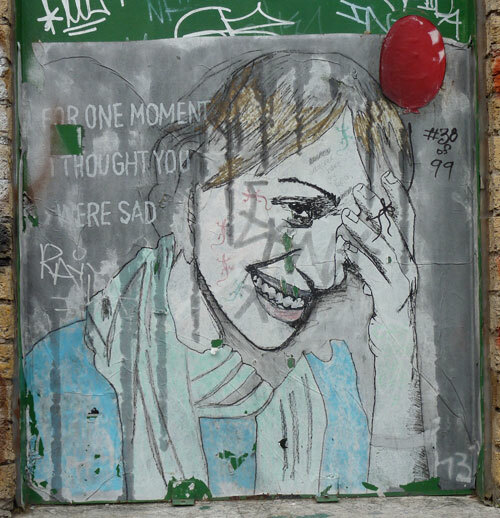 Apparently Brick Lane is world famous for this street art (some done by the mysterious and secretive street artist Banksy). Here’s a small sample. 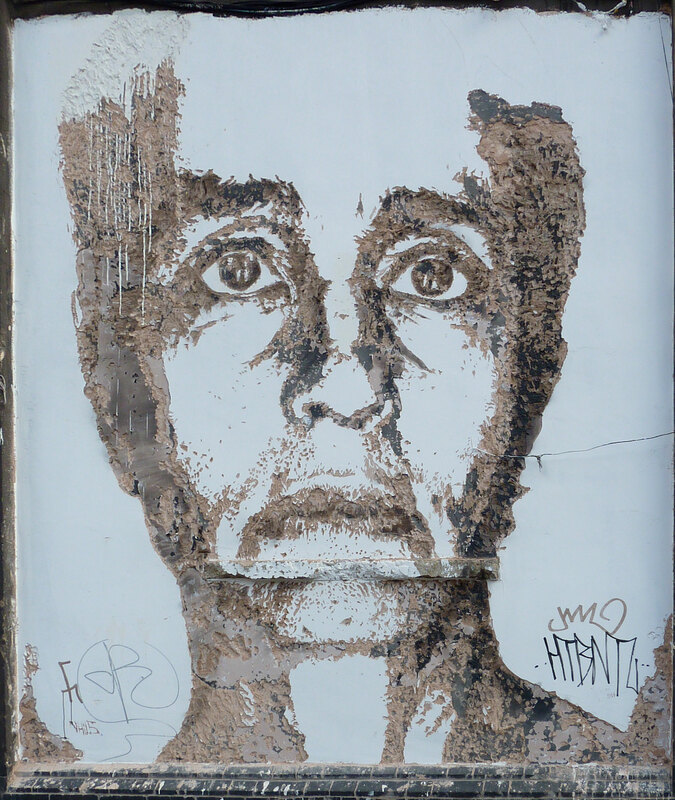 My favourite piece was carved out of a wall which had been painted black then painted white on top, by exposing the different colours they had carved this image – not sure if it is technically graffiti or not but so clever. You can click on this one a couple of times to enlarge to see the detail. 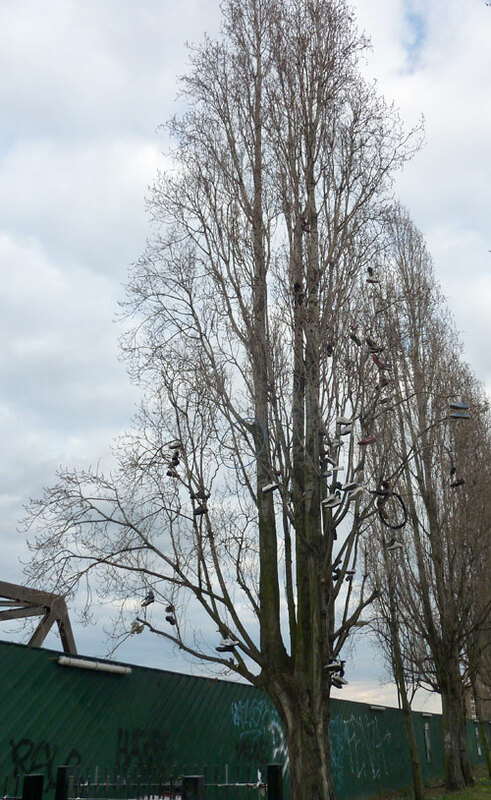 We also passed this on our tour – a shoe tree. No idea what it is all about but very silly none the less. So all in all, a wonderful visit (and if I’m honest well worth £96.) Back home now and putting the finishing touches to the jewellery website (will tell you about it when it’s launched) and looking forward to beginning the wedding album for my god daughter and her husband, using the beautiful book cloth brought over from Paper Source in the US by my ex. I adore Paper Source but they wanted $115 to ship a $63 order. Please Paper Source, open up in the UK or at least sort your shipping costs out. Sheesh. I was trying to work out which were the bits done by Banksy but I suspect his style is being copied with varying degrees of success by others. I suspect it’s all done by remote speakers these days but I do love the thought of the Imam dressed up in a silver spacesuit…. Good to know the ex is good for something…LOL! The graffiti sure are gorgeous…it really is a true art form. What a great area your son is living in now; hope the arrangement works out well! Oh, the ex has his uses! Actually, we are very good friends. Loving your street art I wonder if my mystery impromptu art gallery person got the idea from Brick Lane?? Know what you mean about rail fares I was horrified just before Xmas sat on the train when a chap bought his ticket on a peak 1st class seat and was charged… £408…. blimey you could fly almost around the world for that!! … Needless to say he paid it without a murmur so he must have had a fat cat expense account! At least it is ‘artistic’ graffiti not just mindless scribbling. I loved your impromptu gallery – has any more been added? £408? Ridiculous. I have travelled First Class on South West trains a few times – complete waste of money, you don’t get anything extra for all that money – I would have thought for that sort of money they could have thrown in a complimentary cup of coffee and a newspaper but no.